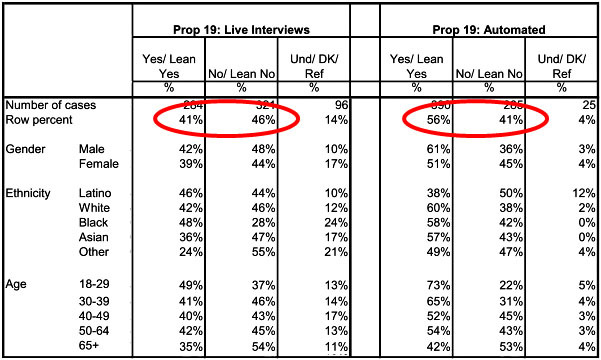 Via Mark Kleiman, here’s an interesting poll result for Proposition 19, the initiative to legalize marijuana cultivation and sale in California. It comes from the pro-19 forces, and I don’t have any independent way of knowing how reliable it is, but it shows that standard polling has Prop 19 losing 46%-41%, while automated polling shows it winning 56%-41%. Take this for what it’s worth. I’m basically skeptical that Prop 19 will pass, and I have my doubts that there’s really such a large number of people who are afraid to express support for Prop 19 to a live interviewer. Supporting pot legalization isn’t really a huge stigma in California, after all. Still, it’s interesting if it’s legit. We’ll find out a week from Tuesday.